The house was perfect for our needs with a lovely little roof terrace. Plenty of space for three of us, although it could accommodate 4 or 5 and nice bathrooms. The location was also good - quiet but within easy walking distance of sites and souks. Hassan met us and showed us round and was willing to help, although we did not need anything else. Kitchen was small and not very well equipped so one wouldn't be wanting to prepare a lot of meals there, but there are a number of places close by so it is not a big issue. Wifi only works within about a metre of the modem, but again, not a big issue within the grand scheme of things which is that this is a typical Moroccan house - great place from which to sample Marrakech. We stayed here February 2019 and were a family of four with children aged 9 & 11. Communicating with Vero was very easy. It was our first time in Morocco and after an overnight flight and 3 hour train journey from Casa were a little apprehensive that we would not find Hassan who would take us to the house in the Medina. That was not the case. Everyone uses WhatsApp so we easily communicated with him. I would recommend that you arrange to meet at the Boulangerie/Patisserie shop on the corner next to where the taxi’s are. You can have a cup of tea/coffee as you wait. This riad is situated in the medina yet it feels like it is on the edge so away from some of the craziness. It is really easy to find your way back to it – again we were apprehensive which proved unnecessary. The riad itself is very well organized and comfortable. Make sure you bring your own toiletries including soap. Also a tip that we learned from another riad in Fes, in all the showers and sinks there are stoppers/plugs. Keep these plugged in. The plumbing system in the medina is several hundred years old and sometimes a smell moves through the pipes. By keeping the plugs/stoppers in it prevents any smells from coming in. If I was coming back though Marrakesh I would come back to Vero’s riad. We had a wonderful stay in Vero's riad. The location was perfect, close to shopping restaurants and the pick up location for our day trip. Communication with Vero was easy and she was always quick to respond to us. The information she sent about the local area was much appreciated. From arranging a ride to and from the airport, to breakfast made by Hassan, every detail was taken care of and it allowed us to relax and enjoy ourselves that much more. Hassan was so kind and we very much appreciated his hospitality. The riad itself was lovely and comfortable and provided plenty of room for us. We want to visit Marrakech again someday and if we ever do, we will try to stay at Vero's riad again. We highly recommend! The riad is beautiful, spacious, clean, and quiet. Centrally located in the Médina, the historic center of Marrakech. We enjoyed walking the winding stone path to the riad. Hassan was very helpful and willing to arrange for anything we needed. We would stay here again. Vero provided stellar and detailed recommendations for dining and fun. Hassan and Abdul were also fabulous and welcoming. Dar Moha was a wonderful fine dining experience with great live music right next to the apt. Eating in the Medina bullpen of guys pulling on you to eat was fun too. Mint tea is our new favorite drink! Wonderful from the moment we were picked up too the time we were dropped off at the airport. The properly is better than the photos would indicate. It's clean and cool, and comfortable. The beds are nice and the on-site laundry is an excellent bonus. We had a wonderful meal when we arrived and breakfast every morning. I can't recommend this riad enough!!! The riad is located at Dar El Bacha, ideally located for exploring the medina of Marrakech: souks, Jemaa El Fna square (at a 10-minute walk), Marrakech museum, Medersa Ben Youssef, Majorelle garden, Bahia palace, Saadian tombs... The riad is located in a quiet derb (small street without car). Taxi station at a 3-minute walk from the Riad. 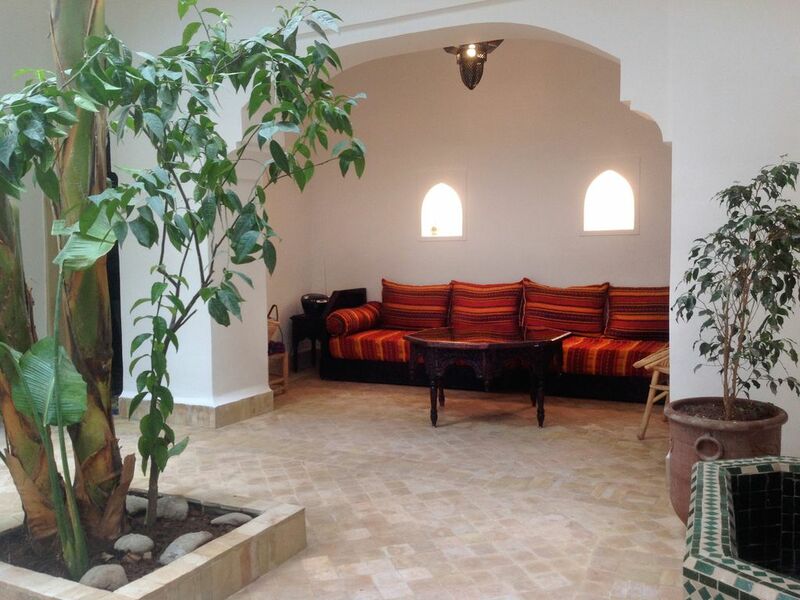 The Riad : DOWN : Entrance + Toilet + Living room TV + Open-air living room + Open-air patio + Dining room + Kitchen. FIRST FLOOR : 2 rooms with bathrooms. First bedroom : 1 bed for 2 persons (140), air conditioned, cupboards, bathroom with washbowl, tub with shower and toilet. Second bedroom : 2 beds for 1 person (80) or 1 bed for 2 persons (160), air conditioned, cupboards, bathroom with washbowl, shower and toilet. SECOND FLOOR : sun terrace and 4 sofas under pergola.